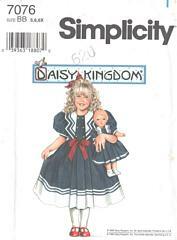 Girls' sailor style dress pattern and matching dress pattern for 17 inch dolls. Dress shown is cut crosswise of double border printed fabric, has short puffed sleeves gathered to bands, button trim, ribbon bow, back zipper and ties. Pleated full skirt and attached slip gathered to bodice at raised waistline seam. Slip has net ruffle. The collar shown is cut from pre printed panel that was manufactured by Daisy Kingdom and is very difficult to find now. To create a similar style of accenting you could possibly use navy blue soutache braid or ribbon. Pattern is uncut and in original folds.